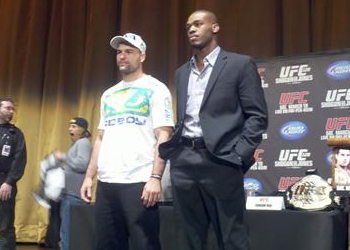 “UFC 128: Shogun vs. Jones” will be jumping off tonight inside the Prudential Center in Newark, New Jersey. The first preliminary bout is scheduled to start at approximately 7:20PM ET/4:20PM PT. Make sure to stay with 5thRound.com all night for our live coverage. Jon Jones will challenge Mauricio “Shogun” Rua for his light heavyweight title in the night’s featured contest, while former WEC champ Urijah Faber takes on Eddie Wineland in the card’s co-main event. The UFC’s Facebook page kicks off the festivities with a pair of live preliminary bouts at 8PM ET/5PM PT. Spike TV will immediately follow up with two free fights of their own at 9PM ET/6PM PT. The pay-per-view broadcast begins at 10PM ET/7PM PT.